Keywords, phrases, density of words are few very important terms for SEO (search engine optimization) experts. Specific keywords or phrases on a webpage can bump webpage ranking UP or DOWN within a search engine. 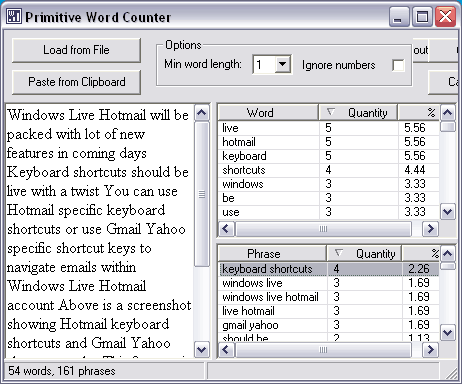 Primitive Word Counter is a portable tool for dead simple way to grab and view high density keywords, phrases on a webpage or text document. To get started, click on “Load a File” button to import text from a document. For webpage text analysis, just copy text on specific webpage and click “Paste from Clipboard” button in application window. Copied text will be loaded in the application and then click on GO button. It will show “words” and “Phrases” along with their quantity number and percentage value density. Click save button to save results of words and phrases in seperate Excel files. Grab Primitive Word Counter, just download and use (no install required). One handy tool for quick analysis of keywords density within specific text or webpage.